Long-term Hornbill customer Merton recently undertook a significant transformation programme to become a leaner and more responsive organisation. Back office functions including the IT service desk were seen as a major enabler of this transformation. In order to support the transformation goals, Merton’s IT Management team made the decision to upgrade to Hornbill’s Supportworks ITSM Enterprise version 3. With telephone support being the primary channel for logging service issues at busy periods, end-users often experienced long waiting times. Consequently, a key driver for the move to Supportworks ITSM Enterprise v3 was to reduce the volume of calls into the service desk by encouraging end-users to use the Supportworks Customer Portal. The Customer Portal within Supportworks ITSM Enterprise enables customers to submit incidents, request loan equipment, track the progress of incident calls and view FAQs and quick tips that may help them diagnose and resolve issues themselves. Within three months of implementation, Supportworks ITSM Enterprise v3 helped Merton achieve over a third of its annual goal of 50% adoption of the Customer Portal. In addition to the wider benefits of the solution, the IT service desk is continually identifying new approaches to improve efficiency and service desk responsiveness. The initial phase of the Customer Portal implementation has allowed end-users to log service issues and track progress all the way to resolution. This has contributed to a 20% reduction in calls to the service desk. Merton have already integrated the existing knowledge base into the Customer Portal, allowing end-users to quickly perform certain tasks, such as basic diagnosis (checking leads are plugged in etc.) and provisioning (e.g. adding a mailbox), themselves from one interface. The next phase is to introduce the Service Catalog which will enable customers to subscribe to the services they need with the added benefit of being able to raise simple service requests via the portal. The council also aims to take advantage of the Twitter integration capabilities in Supportworks, creating another channel that further enhances the self-service strategy. 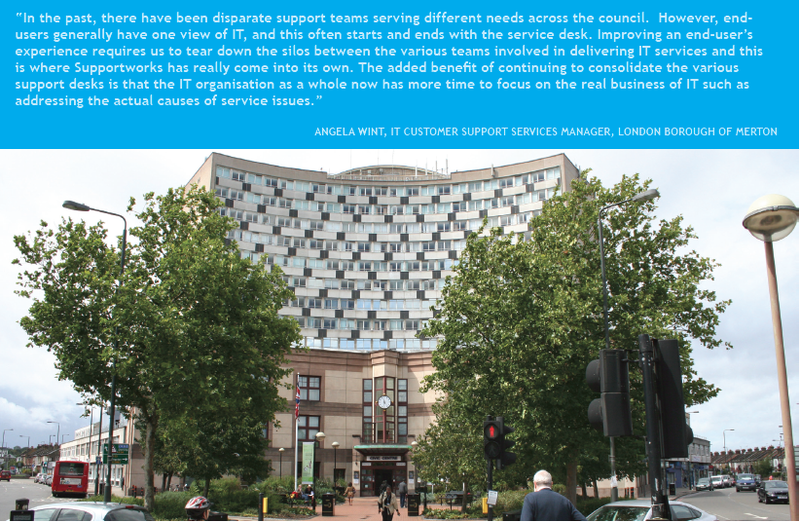 The flexibility of the Supportworks ITSM platform has supported Merton’s IT strategy: to centralise a number of disparate business support desks into the core IT service desk supporting over 2,400 desktops, which have access to over 100 separate systems. Additionally the workload on second-line teams has reduced as the service desk has increased their knowledge and been able to resolve more calls at the point of contact. Ease-of-integration with the inventory management system has helped Merton improve its control of assets and has enabled some manual tasks to be automated. As an example, the asset management team can flag laptop users that require an inventory audit or software update. If the laptop is brought into the service desk, they can ensure that device is passed to the relevant team to carry out that work before the machine is returned to the end-user. The business logic within Supportworks ITSM has enabled Merton to develop innovative processes across other aspects of IT. For instance, the platform is now being developed to filter through over 1,000 general security alerts received each week from the council’s central antivirus server. This will result in automatic logging and assigning of calls for the critical threats, thus creating a fully auditable record of how they were managed. 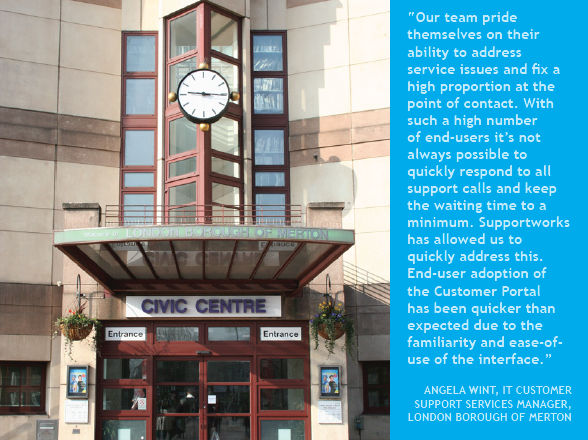 In addition, Merton has recently been able to extend Supportworks ITSM to its Facilities Management service desk to help improve efficiency and standardise the way support services are delivered across this department.